Bajaj Auto has unveiled the 2017 Pulsar RS200 to a select few dealers in Turkey. The updates include a new colour scheme and automatic headlamp on (AHO) feature. 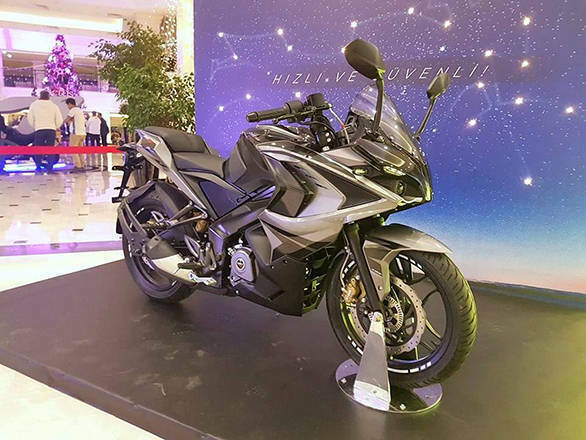 It retains the same 199.5cc, single-cylinder, 4-stroke liquid-cooled SOHC engine of the existing model, but it has too received a slight update. The engine is now BS-IV compliant but there is no change in the power and torque figures. It makes 24.5PS of power and 18.6Nm of torque. The engine comes coupled to a 6-speed gearbox. There are no changes on the 2017 RS200 with respect to dimensions as well. It measures 1,999mm in length, 1,114mm in height and 765mm in width. It continues to have a 157mm ground clearance and a kerb weight of 165 kilograms. The 2017 Pulsar RS200 is expected to be launched in India sometime this January. The Pulsar RS200 was launched in India in March 2015. In December 2016, the Bajaj Dominar was launched at Rs 1.36 lakh for the non-ABS version while the Dominar dual-channel ABS version costs Rs 1.5 lakh (both prices, ex-showroom Delhi). It will be interesting to see how Bajaj Auto pulls off the pricing of the 2017 RS200. The current Pulsar RS200 costs Rs 1.21 lakh (ex-showroom, Delhi). Also, Bajaj Auto has recently announced a price hike across all models in India.